Whole grain oats and nuts, contain dietary fiber. Mixed with Raisins for a richer taste and texture. Reduces Cholesterol, Great Source of Protein and Fiber, Great Source of Vitamin E.
1. 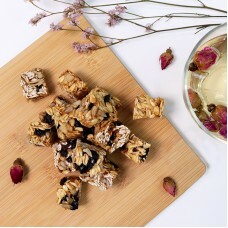 Prepare 30g Almond, 50g Raisins, 30g Sunflower Seeds, 120g Raw Oats. Mix all of them together. 2. Prepare 80g Mashed Banana, 40g Honey, 1tsp Lemon Juice, 70g Orange Juice. Mix all of them together. 3. Mix Step 1 and Step 2 ingredients together. Arrange onto tray with shaper (optional). 4. Dehydrate it at 70°C for 12 hours.